Girl From Ipanema Goes To Greenland is the best B-52’s song that isn’t Rock Lobster or Channel Z. This is a fact that can’t be denied. Any denial should immediately result in a slow and painful deaf. Taken from Bouncing off the Satellites, the group’s darkest and most melancholic album, Girl From Ipanema is a song that glows in the gloom. It sounds like a portent of the future, an arrow pointing in the right direction. Whereas previous album Whammy! unashamedly leapt into the popular and (then) current new-wave sound, and future album Cosmic Thing would smash the charts, Bouncing off the Satellites was the necessary step in between establishing a solid foundation for the future; building on what came before, laying the groundwork for what would come later. It sought to consolidate and refine the B-52’s kitschy fun pop appeal, applying it to an explicit synthpop sound. It didn’t totally work for many reasons, chief of which was the ill-health of founding member Ricky Wilson, who died of AIDS at 32. Devastated by his death, the band barely promoted the album outside of a few videos. Despite the musical feebleness of Bouncing off the Satellites, regardless of its troubled creation, it had one thing going for it. One special song. Just four minutes and twenty-two seconds of genius that transcended the rest of the track list. Girl From Ipanema Goes To Greenland is prime B-52’s. A tour de force of fabulosity, sci-fi sexiness, kitty boom boom pop funrama zoom zoom with x-ray spex and glamour galore. Why do I love Girl From Ipanema Goes To Greenland so much? Why is it one of my favourite B-52’s songs? What makes it so special? The song’s title is a pastiche of The Girl From Ipanema by Antônio Carlos Jobim. But why did The B-52’s send The Girl From Ipanema to Greenland? Why not Bournemouth or Scunthorpe? Actually, Girl From Ipanema Goes To Cumbernauld might have worked. This girl’s lost someone. Who is that someone? She’s leaving. As a lyric, it’s horribly prescient when you consider that the singer of this track is Cindy Wilson, whose brother Ricky co-wrote the band’s songs. As detailed above, he died soon after this was recorded. Witch-doctors are screaming/Nymphs are dreaming. This sort of odd, wistful lyric isn’t typical of The B-52’s. Sci-fi kitsch is usually their bag. Instead, we’re left with the image of screaming witch doctors over a synthy beat. I’m not complaining. Hot latitudes, cool attitudes/She’s leaving/Moon in her mirror/Chasing northern lights. It sounds like our protagonist wants to break free, escape somewhere…anywhere…else. This song makes me want to go along for the ride. 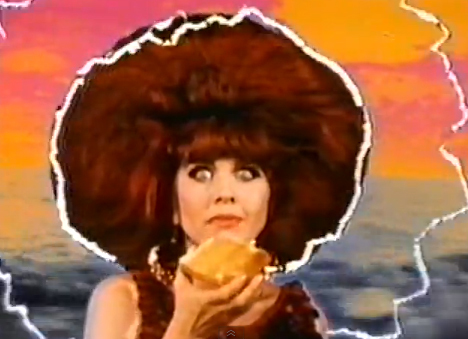 Kate Pierson turning bread into toast with her magical powers. Cindy Wilson doing a bizarre Carmen Miranda impression. The band doing a weird Walk Like An Egyptian linedance with a giant foot. And the best bit of the video? Look up at the moon. It’s Ricky Wilson! Girl From Ipanema Goes To Greenland is a song I never tire of hearing from an underappreciated band I’ll always love. The B-52’s suffer from being terminally underrated. Why don’t we take them more seriously? They’re fun. They write cracking songs. They’ve got a great image. They have a strong brand. Goodness, a duet with Kate Pierson was enough to turn an REM song into a B-52’s soundalike song. Shiny Happy People could be on a B-52’s Hits compilation and I doubt anyone, including Michael Stipe, would protest. The B-52’s have lots of songs we know, and plenty we don’t. Songs like Girl From Ipanema Goes To Greenland. Objectively, it might not be on the level of – yes, I’m going to mention it – Love Shack, but I’d choose Girl From Ipanema Goes To Greenland over Love Shack any day or night. I’d choose it over most songs, actually.